Villa Stella is situated in the Postira, village full of beautiful small beaches. 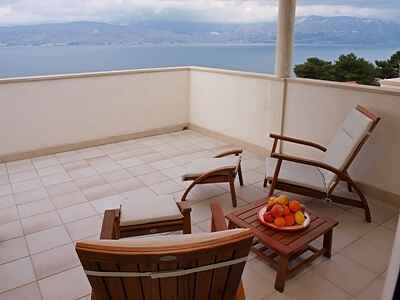 Enjoy your vacation in elegantly equipped apartments which bright and comfortable furniture and magnificent views over the sea and Split from the balconies. The beach can be reached within 5 minutes by foot. Close to Villa Stella you can take a walk in fragrant pine woods near sea. The owners will happily assist you should you have any requests. Villa Stella has 6 apartaments, include 2 de lux apartaments. We have three apartaments for up to six people, one for four people, one family room with two double beds and one double room with use of kitchen. We are situated in the quiet area. Apartaments have free internet, free parking places, TV SAT, grill house, air condition.